Most of you will probable recognize the name of Nicolas Skog as the (sympathetic) guy behind one of Canada’s finest labels, Hypnotic Dirge Records. But he’s the guy as well who plays in Ancient Tundra, a project that surprised me enormously last year with Lost In Claustrophobic Thoughts. Though, I was quite 'happy' too with both splits on his own label, being with Old Forgotten Lands and, especially, Symbiosis. Actually, this project was born a decade ago, and via its Bandcamp page, you might find an anthology that covers the earliest years of Ancient Tundra’s existence. The review deals with a one-track EP that is available via digital sources. Actually, it is an old piece, written and recorded in 2009, but it never made it to a physical edition. It was meant to be a part of a conceptual album (part of a series, if I remember from an interview I once read), but things went silent at that moment, and Ancient Tundra never totally finished the song. Recently, however, Nicolas decided to have this composition brought back to life. For the better part, it is based on the original recordings, yet with some additional instrumental elements, and newly recorded vocals. The latter are performed, by the way, by no-one else but Altar Of Grief’s Damian Smith. Damian also reworked the lyrical side. The reason why this song won’t be part of the upcoming new album is quite simple. The newly written stuff differs from the old works, dixit Nicolas, so it’s like an epos to close the past. All Light Has Since Escaped Me isn’t but 10:22 minutes of length, but it’s worth being mentioned. It starts with a somewhat melancholic semi-acoustic part, soon joined by fairylike and floating electric guitars. I just adore the unpolished, rusty sound of those guitars. 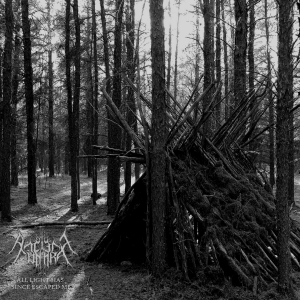 After two and a half minutes, the track organically transforms into a hypnotic, breath-taking moment of Dark Ambient (Ancient Tundra started as an Ambient-oriented project, before moving over towards more blackened proportions), but quite soon those underground guitars rejoin the joy (???). There’s so much emotion during these passages. At about four minutes, step by step, things become nastier, and more guitars and bass, drums (drum programming?) and synths enter. When the keyboards and voices join in, you get drawn by atmospheres that combine pain and depression at the one hand, and disgust and hatred at the other. Not only lyric-wise this is the case, but the instrumental execution does as well. Towards the end, and that is quite ‘amusing’ too, there are some harmony vocals too, adding a subtle touch of primal Folk Epic. Anyway, since this isn’t ‘but’ a short one-track single, I won’t go too deep into the matter. Let’s say that I do look forward to listen to the new material, as soon as it gets finished, but I kindly invite you, dear reader, to take a listen to this pièce d’art.